The Museum provides a fascinating view of the story of tennis through artefacts, inter-actives and films, the original trophies, and a resident ‘ghost’ of John McEnroe. Touch screens and audio-guides bring the Museum to life. Tours of the grounds are available giving access to restricted areas including Centre Court. Pre-booking essential on 020 8946 6131. One of the top attractions in London, the award-winning Wimbledon Lawn Tennis Museum provides visitors from around the world with the opportunity to view items of immense historical importance, with some exhibits dating from the 1550s on show in the highly interactive Museum. The Blue Badge Guide Tour of the Wimbledon grounds provides an in-depth look at Wimbledon and the delights of The Championships. Visitors can enjoy views of London from the picnic terraces; see where the action happens on Centre Court and take in other exciting areas of interest which are normally unseen by the public, all contributing to the ultimate Museum experience. Group bookings of fifteen or more can be made in advance, available in English, French, German, Spanish, Italian, Japanese, Cantonese, Mandarin and other languages when pre-arranged. Wimbledon Lawn Tennis Museum is delighted to announce the arrival of their impressive new exhibition, Powerful Posters: Tennis and Advertising, 1893-2015 opening on 20 March 2015. The vibrant new display will capture the rich history of tennis culture, fashions and traditions throughout the ages. One of the most thrilling pieces on display will be none other than the white dress featured in the world famous ‘Tennis Girl’ poster of the 1970s. First featured on a 1977 calendar, it was later made into a poster, produced by Athena, selling more than 2 million copies worldwide. The poster is so well-known that the pose has been parodied several times, even by 1987 Wimbledon champion Pat Cash. The model, Fiona Butler, was 18 years old at the time and had borrowed the dress and racket from her friend, Carol Knotts. The dress was handmade by Knotts herself from a pattern. Visitors to the exhibition will see posters dating from 1893 to the present day, among them the official poster for The Championships 2015. Created by artist and illustrator Yulia Brodskaya, the poster is an elegant and detailed paper illustration, which brings to life the intricacies and traditions of The Championships in a design that celebrates the new start date of The Championships in 2015. 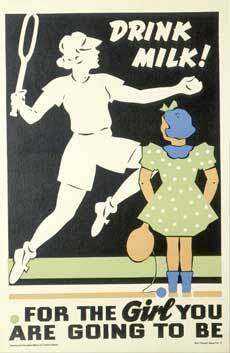 However, only a small collection of the posters on display advertise The Championships itself. The posters reveal how the prestige and glamour of tennis has been used to advertise fashion, films, fruit and even flights, endorsing everything from soft drinks to brandy, hotels, fish and milk. Those with a particular interest in the progression of poster design and artistic interpretation can marvel at the stylish Art Deco and the early letterpress posters, styles which have evolved through to the present day. In the run up to the opening of Powerful Posters, the Museum will be launching a social media competition across Twitter, Facebook and Instagram. Applicants will be in with a chance to win free tickets for the Museum and Tour to see the exhibition. Details will be announced on Twitter – follow @Wimbledon. Visitors to the Museum can complete their experience by taking the exclusive Blue Badge Guide Tour of the Wimbledon grounds giving an intimate look at Wimbledon, and the delights of The Championships.